When standing on the start line of a marathon, we all have a target time in our head. Some will be gunning for sub-3 hours whilst others dream of ducking under 5. No matter what time you have in your sights, these are some of the courses that will give you the best chance of hitting your target and setting a new PB. Plenty of other runners at your target time. This will help with pacing. No congestion. Its very common for the first mile to be crowded but too much congestion will leave you behind schedule before you’ve even really got going. Crowd support. Don’t underestimate the power of the crowd! Its surprising how uplifting a cheer from a complete stranger can be when you’re at the business end of a marathon. City runs are great for this as it’s easy for spectators. Choose a course that's right for you. Noisy crowds aren’t for everyone. Some will prefer the relatively quiet, more scenic routes offered by races such as Chester. The perfect storm of all these elements can be found in the below list: the fastest courses in the UK (in no particular order). The height gain of only 54 metres makes this 'officially' the flattest marathon in the UK. Manchester has been the winner of 'UK's Best Marathon' for two years running at the Running Awards, with a great atmosphere and a memorable finish line at Manchester United Football Club. The course is along the traffic-free promenade of this famous UK holiday resort, taking in the sights of the Golden Mile, Blackpool Tower and the Piers. As the course is along the sea-front it is pretty flat, but open to the elements. In the right conditions, this is a very fast course. Milton Keynes is already a fast course, but the Race Director, Andy Hully, is working on an even flatter route for 2016. The new route will also have less city centre loop backs and precisely 60% less underpasses, making it more interesting and NO hill at mile 24. Known as the ‘Green Marathon', the route takes you on a scenic tour of 4,500 acres of woodlands, lakesides, parks and landscaped areas within the city boundary, before finishing inside Stadium MK. The first few miles of Edinburgh are gently down hill, the rest is undulating. This course has been described as the fastest marathon course in the UK, perfect for those chasing a PB. Runners can expect a lively atmosphere. 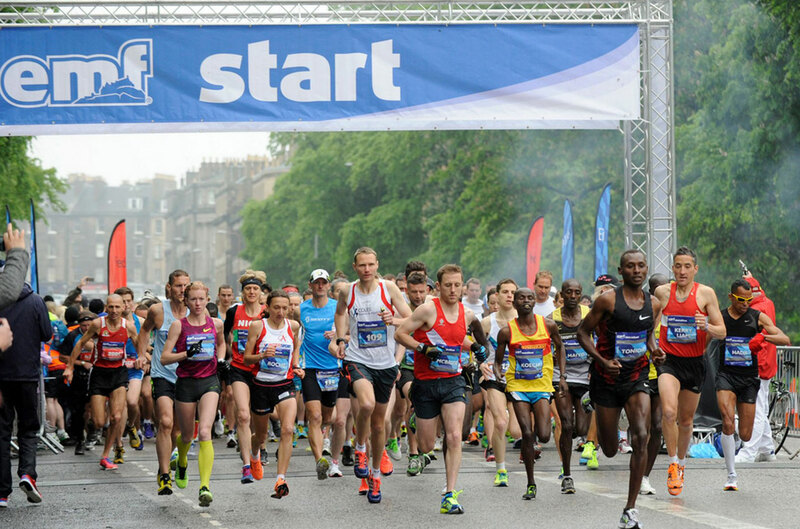 The marathon is the main event in the weekend-long Edinburgh Marathon Festival which sees 30,000 people running in one of 7 different events including junior and relay races. Chester is a biggie, one of the UK's most popular marathons. 70% of runners achieved a PB on this course in 2014 so it must be quick. The course starts and finished in the historic centre of Chester and loops out into the scenic Cheshire and North Wales villages and countryside. Some varying data, but apparently this is flatter than London so a potentially fast course. They also have pace makers to help you go for that PB – a big plus. The Yorkshire marathon has quickly established itself as one of the highlights of the White Rose County's sporting year, this PB potential course takes runners through the heart of medieval York and through some of the UK's most beautiful countryside, with a spectacular grand finale at the University of York.